Summaries & Grouping on a CRM Report can help you analyse your data more effectively. A summary will appear at the top of your CRM Report showing a count of your chosen field. 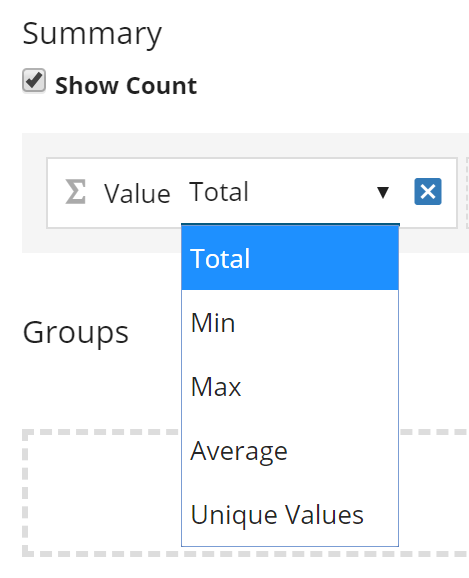 The Summary can display the total, minimum, maximum, average & unique values. The grouping will change the display of the Report & group the data based on your chosen field. Please note that you can also add summaries to these individual groups on the Report. Once you have chosen/built your Report within the CRM & have applied the appropriate filters, click on the further options icon (three dots) & select 'Grouping and Summary' from the drop down. On the right-hand side a tree like view will be displayed of all the related fields that you could use as a summary. For example you may wish to summarise the Report by Lead Value. Drag & drop the field you wish to summarise into the summary drag & drop section. Please note that you can have multiple summaries on your Report, just drag & drop them all into the drag & drop section. You will then be able to choose how the summary will be displayed e.g. Total or Average. Once happy with your selection click 'Submit' in the top right-hand corner. This will then display your new summary at the top of your Report, along with the count if you have it selected as well. On the right-hand side, a tree like view will be displayed of all the related fields that you could use as a group. For example you may wish to group the Lead Report by Lead Type. Drag & drop the field you wish to group the Report by into the group drag & drop section. 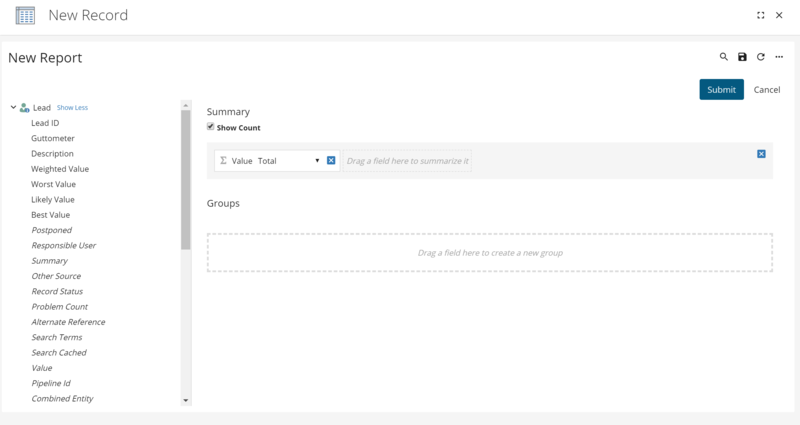 You will then have the option to also summary to the groups by dragging & dropping the required field. For example, you may wish to summarise the groups by Lead Value. Please note that you can also click on the sort icon to decide whether the groups are displayed in ascending or descending alphabetical order. Once happy with your selection click 'Submit' in the top right-hand corner. This will then display your new groups in the Report, along with the summary if you have set one.